Let’s suppose you’d like to let the visitors of your website make a video recording or take a picture of their face. How can you explain to them how close they’re supposed to sit to the camera? You could write lengthy instructions, but you know that today almost nobody reads the instructions. Probably, a better approach to solve this problem would be to use a face detection algorithm that can evaluate where a face is in proportion to the frame, figuring out if the face is too far away or too close. My development team at Mozilla needed a “video booth” feature where people were able to record themselves talking into the web camera and have those videos uploaded and shared, all in a web application. In cases like this one, the quality problems are usually related to the audio. Ideally people should use a decent quality microphone and sit in a room with minimal echo, but often it isn’t possible. The best way to solve this issue is to ensure the user sits close to the built-in microphone of their laptop. To do that, we have implemented a face detection on the viewfinder, in order to tell them whether they are sitting near enough or not. In this article, I’ll show you how to build this functionality and learn something about the components involved. The getUserMedia stream API has been in hectic flux across the major modern browsers. The navigator.getUserMedia API really worked only with various vendor prefixing hacks. The new getUserMedia stream API works in most modern desktop browsers including Microsoft Edge but not on either Safari or any Webkit based browser on iOS. Now that you have the MediaStream object (called just stream in the code example above) you need to project it onto something. What you project it on is a video element by using a method called URL.createObjectURL(blob). We’ll add one of those and continue the example code where the stream object is available. You can find a slightly more complete and functional example here. If you played with the above demo, you should have been able to see your face animated in the view finder. But did you notice how hard it was to position yourself in the middle? That’s because the picture in the view finder is not your mirror image. It’s an actual view of your face, just like your friends see you. If you tilt your head towards your left ear, the face in the view finder appears to tilt to the right. This is awkward, even though it’s not supposed to be. After all, you intend to record your face talking, so that people who can’t be there in person can benefit from being able to view it later as a video clip or picture. We so rarely see our own faces recorded in a video but we often see our own faces in a mirror. See the Pen xwzaQE by SitePoint (@SitePoint) on CodePen. Don’t you think it seems more natural and expected? Suddenly it becomes a lot easier to manage how to center your face. Projecting the stream onto the <video> tag has the advantage that it’s fast and efficient. The disadvantage is that we can’t manipulate or analyze it there. For this purpose we need a <canvas> tag and its 2D context. Basically, the whole trick here reduces to this: you take a stream (from starting a navigator.mediaDevices.getUserMedia instance) and display it in two places. One to a <video> tag (that is the “view finder”), one to a <canvas> tag (i.e. the “analyzer”). After that, we send each frame of the <canvas> into the face detection software, draw the conclusions from that and feed them back to the user. As the first step, let’s add the canvas element and feed frames to it at a rate of every 1/10th of a second. Here’s a demo where the canvas element is employed but hidden. The context.drawImage API is awesome. We can simply pass it a video element, then the upper left corner coordinate and finally also the lower right corner coordinate. Here we go! We have the picture of our web camera fully projected onto a <canvas>. Neat! The files we want to use are available from a GitHub project called ccv developed by Liu Liu who works at Snapchat. CCV is basically a project written in C with some nontrivial learning algorithms that know which patterns to expect when looking for a human face, for example. How do we actually use this? Let’s extend our existing demo and let it spit out any found faces on the console. Here you can find the demo where each detected face is console logged. To understand what we’ve got, the rather traditional thing to do is to render a square over the image (in the <canvas>) so we can understand what these width, height, x and y are. Let’s do that by not hiding the canvas and drawing a red rectangle on it. See the Pen dYKqBV by SitePoint (@SitePoint) on CodePen. The face rectangle sometimes disappears. Especially if you “move out of sight” or hold up a hand over one half of your face. This is because the model isn’t perfect. It’s an approximate model that tries to work in the best possible way. As you move closer and further away from the camera (i.e. the screen on your laptop) the rectangle shrinks and grows. That is the clue to our next step! The distance from your nose to your screen (where the camera presumably is) is figured out thanks to the height value in the face detection result(s). If you know the height of the face and the height of the canvas, you can figure out a percentage that would represent “the right distance from the screen”. But please note that you decide this percentage! The best way to figure this out is to test it on yourself and look at what percentage the rectangle is. This demo helps you debug the percentage/ratio of your face compared to the canvas. 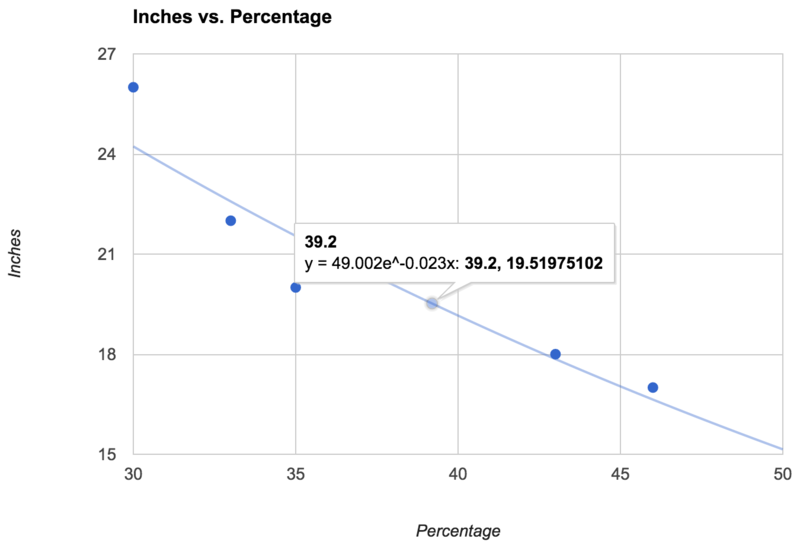 This demo shows that now the percentage number doesn’t jump much. What about the Actual Distance from the Screen? As you can see, this gives us a formula. Let’s use it to say the distance in inches instead. See the Pen xwzavg by SitePoint (@SitePoint) on CodePen. As you can probably see, this isn’t very accurate since the software model isn’t perfect and there are many calculations to repeat. You can’t depend on an exact number. The application we’ve built at work didn’t expose any numbers like this last demo. It just showed a badge that would say: “A bit closer please”, “Back a bit please”, and “Good face distance” as you move back and forth. Nobody expects it to be particularly accurate, but every time we see people using the application for the first time, it puts a smile on their face that we’re at least trying. In conclusion, was it worth it? This technique of letting the person in front of the camera know if they sit too close or too far away from the screen is very inaccurate. Being aware of that, you need to take that with a pinch of salt and a sense of humor. It’s not very different from those traditional photo booths they have at airports, shopping malls, or train stations. There’s a silhouette of a face with perfect un-human-like geometric proportions and it acts as a guide to where you’re roughly supposed to place your face. The point of it all was to get a good hold of how to use navigator.mediaDevices.getUserMedia together with the CCV library for something fun. You can probably think of many other funny applications such as overlaying funny hats, sunglasses or mustaches over the viewfinder. All the tools you need to build that are demonstrated in this article, but whatever you do, make it something silly.